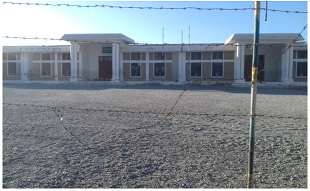 Saindak school was established by the Baluchistan government on July 1st, 2003 as a Primary school. Keeping in view the location of Saindak and education demands of qualified students, it was upgraded as a middle school in 2008 under the provisional N.O.C (Non objection certificate) issued by the EDO Chaghi. Later on, under the provision of article-50 chapter III of the education and Baluchistan registration of unrecognized educational institutions ordinance 1962; the director of education (Schools) Baluchistan Quetta accorded up-gradation in recognition from Middle to High School. It is pertinent to say that the said school is currently being run by MRDL Company. But regrettably, MRDL School wears a deserted look and does not hold basic facilities like boundary wall, science laboratories, computer lab and furniture. Furthermore, Chinese has installed AC (Air Conditions) for their dogs and ducks whereas, the fans for few classes which are out of order only but not repaired. Due to intensity of hot weather and heat wave the process of perspiration is increasing among innocent students. Accordingly, the sweeper is not dispatched for cleaning the school, the students themselves clean the school. Conceding that the teachers are still working as daily wage employees and are paid a very lesser amount of salary which is even not enough to meet the daily expenses. Unjustifiably, all MRDL employees are given bonus, water allowance, health allowance and home fare except teachers. In spite of all these problems and limited resources the teachers kept continue their struggle which bore fruit in shape of remarkable achievements by MRDL students who gave 90% result and are almost passed with the First Division in the Metric Examination. Eventually, the EDO Chaghi after thorough inspection of MRDL School Saindnak issued a notice and strictly emphasized the school administration to provide examination hall, science labs with all related apparatus and library as per board requirements. Otherwise, the recognition is tenable to be canceled of the above condition are not maintained or fulfilled. Although, MRDL Principal requested Chairman for EPZ (Export processing zone) Pakistan Tariq Hassan, Who had promised for the construction of boundary wall and three science laboratory rooms for MRDL School on his visit to Saindak. Similarly, the principal submitted multiple application to the director of administration for MRDL but nothing materialized on the ground. On 25th of July 2016 a media group is expected to come and make a documentary on Saindak gold and copper project. Therefore, the whole school area was surrounded by barbed wire instead of building a boundary wall. Afterward, the project is about to white wash only two rooms of the school. Actually, the aim behind penning down such article is to expose the real picture of the MRDL School in general and to draw the attention of the Baluchistan incumbent government in particular; So that the government plays a constructive role to remove the grievances of MRDL School.